Itemize your inventory into different boxes, using one box for everyday needs and others for seasonal items. Avoid driving back and forth to a traditional self storage facility by keeping your water-proof SMARTBOX outside your back door for easy and immediate access. Ask about our special retail package which incorporates several, extra free deliveries into your agreement when you sign up for the program. You are required to keep your records and they are piling up in your office. You don’t want to shuttle boxes of records back and forth to a traditional storage facility. Let SMARTBOX deliver a unit to your office periodically to allow you to store your records with convenience. Fill the box up and send it on its way. Give us a call when you have your next batch ready and we will bring the box back. Place a SMARTBOX at your office and you have easy-access, low cost, temporary storage for all of your remodeling or repairing needs. Our boxes are weather proof so leave them outside as long as you need them. If you are a flooring contractor or painter you know that your customers often don’t have enough storage space in their homes while you are working. A SMARTBOX could be the ideal solution to this dilemma. A SMARTBOX will be the most economical solution you can offer them and you may even decide to provide it to them as part of your overall services to differentiate you from the competition. If you are a garage remodeler you know that your customers often don’t have storage space in their house for the garage items while you are working. Often the items need to sit out in the elements. A SMARTBOX could solve this problem. Our smaller sized, lower cost box allows you to offer an alternative to your customer. You may even decide to provide them a SMARTBOX as part of your garage remodeling service to differentiate you from the competition. If you are a water & fire damage specialist you know that your customers often don’t have enough storage space in their homes while you are working. A SMARTBOX could be the ideal solution to this dilemma. We are more flexible and can more effectively match your capacity requirements than the large box portable storage companies. 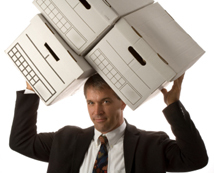 Moving your office is a breeze with SMARTBOX. Take all the time you need to pack your things into the SMARTBOXES, up to a month for one low rate. Break you move into convenient batches so you don’t have to shut the office down. No rushing to get done in a day. No driving a large, awkward moving truck. Just tell us where and when you want your units and we’ll have them there for you. All you need to do is unpack at your leisure. SMARTBOX is the ideal solution for Residential Property managers. Our smaller box size is more appropriate and more affordable for your customers. You can fit 2 SMARTBOXES in a single parking spot without affecting the parking spots on either side. You are trying to rent your property and we can help. Imagine being able to offer a free SMARTBOX to close a rental. Our units are the ideal size for apartment communities. We can easily fit two SMARTBOXES into a single parking spot. Our portable storage competition requires 3 contiguous spaces. Traditional storage also requires 3 contiguous spaces to fit a moving truck. We solve that problem. We are the best, most affordable solution for Apartment Communities, by far. You are bringing residents in from other cities. They are learning there are no basements in Florida . They are learning there is little space in attics in North Florida, especially with engineered Truss systems. Frankly, there is no place to store the things they are accustomed to keeping in their basements. They need an answer and SMARTBOX is it. Your customers need to de-clutter to sell their house quickly. Yet traditional storage requires them to deal with the hassle of renting a truck and moving their things twice – once into the rental truck and then a second time into the storage facility. It is not going to happen. Their other alternative is portable storage. Yet, the existing providers or portable storage require you to rent huge, garage sized unit and pay a king’s ransom to rent them. Not going to happen. Solution: SMARTBOX. Our units are 1/3 the size of other portable storage solutions and we provide the incredible convenience of portable storage. What are you waiting for? Like Real Estate agents, your customers need to de-clutter to sell their house quickly. Yet traditional storage requires them to deal with the hassle of renting a truck and moving their things twice – once into the rental truck and then a second time into the storage facility. It is not going to happen. Their other alternative is portable storage. Yet, the existing providers or portable storage require you to rent huge, garage sized unit and pay a king’s ransom to rent them. Not going to happen. Solution: SMARTBOX. Our units are 1/3 the size of other portable storage solutions and we provide the incredible convenience of portable storage. Help you clients sell their homes! If you are an event organizer, you need to understand that SMARTBOX of Maryland is committed to the community and local charities. We will donate our boxes to any good cause. We understand there are many good causes. Yet, we stand prepared to help as many people as possible. You see, our corporate strategy is to support our community.